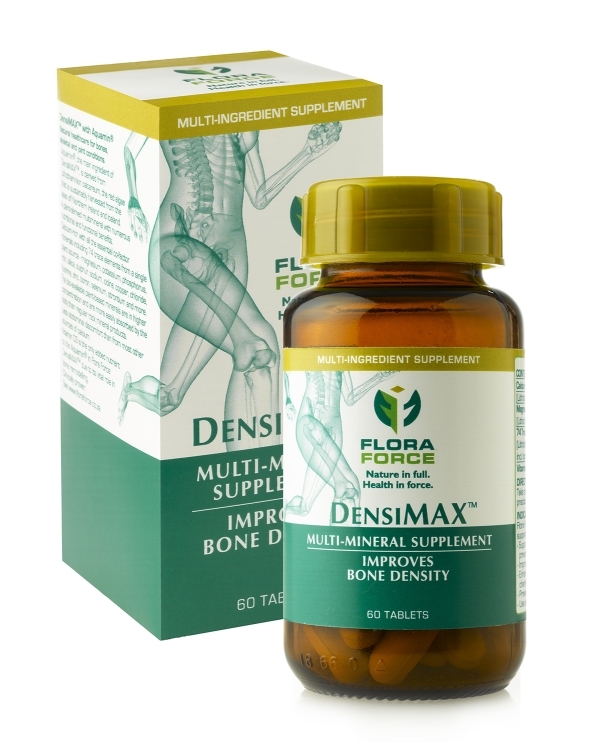 FLORA FORCE® DensiMAX® tablets is a multi-mineral supplement with calcium and Vitamin D; supports healthy bones and teeth and plays a role in maintaining good health. Calcium intake, when combined with sufficient Vitamin D, a healthy diet and regular exercise, may reduce the risk of developing osteoporosis. Free from sugar and lactose. If you are pregnant or breastfeeding, please consult your pharmacist or registered healthcare practitioner for advice before taking DensiMAX®tablets. Read all of this leaflet carefully because it contains important information for you. DensiMAX® tablets are available without a doctor’s prescription, for you to treat a mild illness. Nevertheless, you still need to use DensiMAX® tablets carefully to get the best results from it. Do not share DensiMAX® with any other person. You must see a registered healthcare practitioner if your symptoms worsen or do not improve. Inactive ingredients: gum acacia, sodium carboxy-methyl cellulose, and magnesium stearate. DensiMAX® tablets are free from sugar and lactose. DensiMAX® tablets is a multi-mineral supplement that supports healthy bones and teeth and is a factor in the maintenance of good health. Calcium intake, when combined with sufficient Vitamin D, a healthy diet, and regular exercise, may reduce the risk of developing osteoporosis. If you have abnormally high levels of calcium in the blood and/or excessive loss of calcium in the urine (see “Take special care with DensiMAX® tablets”). If you high or low levels of phosphate in the blood (see “Take special care with DensiMAX® tablets”). Surgery (see “Take special care with DensiMAX® tablets”). Suffer from have abnormally high levels of calcium in the blood and/or excessive loss of calcium in the urine. Conditions that lead to abnormally high levels of calcium in the blood include para-thyroid gland disorders, sarcoidosis, poor kidney function and bone cancer. Conditions that lead to abnormally low levels of calcium in the blood are kidney stones and kidney failure (see “Do NOT take DensiMAX® tablets”). Suffer from high or low levels of phosphate in the blood. You may have to arrange increased monitoring of your phosphate levels when starting or stopping treatment with DensiMAX® tablets (see “Do NOT take DensiMAX® tablets”). Suffer from low levels of stomach acid. People with low levels of gastric acid absorb less calcium if it is taken on an empty stomach. However, low acid levels in the stomach do not reduce calcium absorption if calcium is taken with food (see “Do NOT take DensiMAX® tablets”). Are a smoker. Smokers absorb less calcium from the stomach. The dose of DensiMAX® tablets may need to be adjusted if you smoke. Are undergoing surgery, discontinue use at least 2 weeks prior to the procedure (see “Do NOT take DensiMAX® tablets”). Take warfarin or other blood thinning medicines. You may have to arrange increased monitoring or your INR (International Normalised Ratio) levels when starting or stopping treatment with DensiMAX® tablets (see “Taking other medicines with DensiMAX® tablets”). The use of DensiMAX® tablets in children and adolescents under 18 years of age is not recommended due to lack of adequate data (see “HOW TO TAKE DensiMAX® TABLETS”). DensiMAX® tablets should be taken with meals with water. Use DensiMAX® tablets under supervision of a pharmacist or registered healthcare practitioner. If you are pregnant or breastfeeding your baby, please consult your doctor, pharmacist or registered healthcare practitioner for advice before taking DensiMAX® tablets. No studies on the effect on the ability to drive and use machinery have been performed. It is unlikely that DensiMAX® tablets will impair your ability to drive or use machines. However, please exercise care when driving or operating machinery until you know how DensiMAX® tablets affects you. DensiMAX® tablets are sugar and lactose free. Always tell your pharmacist or registered healthcare practitioner if you are taking any other medicine. (this includes complementary or traditional medicines). Calcipotriene, a medicine similar to vitamin D, for the treatment of psoriasis. Diltiazem for the treatment of high blood pressure, angina and heart rhythm disorders. Lithium for the treatment of bipolar disorder. Potassium sparing diuretics for the treatment of hypertension and management of congestive heart failure. Skeletal muscle relaxants used to alleviate muscle spasms, pain, and hyperreflexia. The dose of the above medications may need to be adjusted when taken with DensiMAX® tablets. Raltegravir (an anti-retroviral medication). DensiMAX® tablets may decrease its levels. Thiazide diuretics. DensiMAX® tablets could increase calcium levels in the blood. Monitor you calcium and parathyroid function regularly if you are using DensiMAX® tablets and thiazide diuretics in combination. Antacids as DensiMAX® tablets may reduce the levels of magnesium. Anti-diabetic medicines. DensiMAX® tablets may increase its effects. Monitor you blood sugar levels regularly if you are using DensiMAX® tablets and anti-diabetic medicines in combination. Warfarin or other blood thinning medicines. DensiMAX® tablets may potentially increase the effect of blood thinning medicines (see “Take special care with DensiMAX® tablets”). Biphosphonates as DensiMAX® tablets can influence the absorption and effectiveness of these medicines (see “HOW TO TAKE DensiMAX® TABLETS”). Levothyroxine, taken for hypothyroidism, as DensiMAX® tablets may decrease its absorption (see “HOW TO TAKE DensiMAX® TABLETS”). Integrase inhibitors, used to treat HIV, as DensiMAX® tablets may decrease the levels of this medication (see “HOW TO TAKE DensiMAX® TABLETS”). Tetracylcine and quinolone antibiotics as DensiMAX® tablets decreases the levels of this medication (see “HOW TO TAKE DensiMAX® TABLETS”). Sotalol as DensiMAX® tablets decreases the levels of this medication (see “HOW TO TAKE DensiMAX® TABLETS”). Gabapectin as DensiMAX® tablets decreases levels of this medication (see “HOW TO TAKE DensiMAX® TABLETS”). Do not share medicines prescribed to you with any other person. Always take DensiMAX® tablets exactly as directed. You should check with your pharmacist or registered healthcare practitioner if you are unsure. Take 1 tablet twice daily with meals or as directed by your pharmacist or registered healthcare practitioner. Not recommended for use (see “Take special care with DensiMAX® tablets”). Bisphosphonates must be taken 30 min prior or at a different time of the day. Levothyroxin must be taken at least 4 hours apart from DensiMAX® tablets. Integrase inhibitors, tetracycline and quinoline antibiotics, sotalol and gabapectin must be taken at least 2 hours before, or 4-6 hours after DensiMAX® tablets (see “Taking other medicines with DensiMAX® tablets”). DensiMAX® tablets may be taken for a period of up to 12 weeks followed by an interval of 1 week after which the next 12-week cycle can commence. However, should you experience any adverse effects or any of the side effects indicated below please consult your pharmacist or registered healthcare practitioner. If you take more DensiMAX® tablets than you should, you may experience thirst, drowsiness, confusion, weakness, difficulty breathing, chest pain and unconsciousness. In the event of over dosage, consult your pharmacist or registered healthcare practitioner. If neither is available, contact the nearest hospital or poison control centre. Always take DensiMAX® tablets as directed. If you miss a dose, take it as soon as you remember. If you do not remember the missed dose till the next dose is due, skip the missed dose and go back to your regular dosing schedule of one tablet twice daily. Do not take a double dose to make up for forgotten individual doses. DensiMAX® tablets may have side-effects. Not all side-effects reported for DensiMAX® tablets. Should your general health worsen or if you experience any untoward effects while taking DensiMAX® tablets, please consult your pharmacist or registered healthcare practitioner for advice. An allergic reaction which may present with shortness of breath, difficulty breathing, wheezing, hives, or itching, swelling of the face, tongue or whole body. Chest pain, nausea, vomiting, constipation, abdominal pain, increased thirst & urination, fatigue, muscle weakness & pain, confusion, disorientation, difficulty talking, headaches, depression and poor appetite. Blood in urine, fever and chills, sever stomach or back pain. Less or more urine than is normal for you. Swollen face, feet and ankles. Stomach discomfort, indigestion, diarrhoea, constipation, belching, acid reflux & heartburn, flatulence. If you notice any side-effects not mentioned in this leaflet, please inform your pharmacist or registered healthcare practitioner. Store at or below 25ºC in a dry place. Protect from light / moisture. Do not take the capsules after the expiry date stated on the packaging material. Return all unused capsules to your pharmacist. Do not dispose of unused capsules in drains or sewerage systems (e.g. toilets). 60 Tablets packed in a 125ml amber glass bottle with a seal and mustard gold screw cap in a product box with a package insert. 23 mm oblong off-white tablet. Flora Force Heath Products (Pty) Ltd.
Inactive ingredients: gum acacia, sodium carboxy-methyl cellulose, magnesium stearate. D 22.2 Vitamins – Other. Aquamin is a marine-sourced multi-mineral, which is derived from the cytoskeleton of the red algae Lithothamnion calcareum. Over the course of the aquatic plant’s life, minerals are accumulated from the seawater, and stored as carbonate salts in the plant. Aquamin™ has the ability to improve osteoblast bone cell mineralisation and promote early bone mineral build-up. By re-mineralizing the cells, the number of osteoblasts are increased. Osteoblasts are responsible for new bone formation. Aquamins’ osteogenic (bone tissue formation) response is improved by the addition of Vitamin D3. 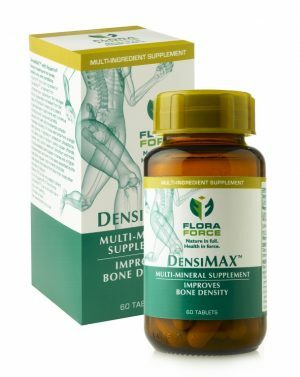 DensiMAX® is a multi-mineral supplement that supports healthy bones and teeth and is a factor in the maintenance of good health. Calcium intake, when combined with sufficient Vitamin D, a healthy diet, and regular exercise, may reduce the risk of developing osteoporosis. A hypersensitivity to calcium, vitamin D or to one of the other ingredients in DensiMAX® tablets including seafood, seaweeds and specific trace minerals. Hyper-calcaemia and/or hyper-calciuria (see “WARNINGS AND SPECIAL PRECAUTIONS”). Hyper-phosphatemia and/or hypo-phosphataemia (see “WARNINGS AND SPECIAL PRECAUTIONS”). Achlorhydria (see “WARNING AND SPECIAL PRECAUTIONS”). Smoking (see “WARNING AND SPECIAL PRECAUTIONS”). Surgery (see “WARNINGS AND SPECIAL PRECUATIONS”). DensiMAX® tablets should be used with care in patients with hyper-calcaemia and/or hyper-calciuria (see “CONTRA-INDICATIONS”). DensiMAX® tablets should be used with care in conditions that could lead to increased calcium absorption and hypercalcaemia such as, hyper-parathyroidism, renal insufficiency, sarcoidosis, bone tumour and myeloma (see “CONTRA-INDICATIONS”). DensiMAX™ tablets should be used with care in conditions that could lead to decreased renal calcium reabsorption and hyper-calciuria such as kidney stones, nephron-calcinosis and kidney failure (see “CONTRA-INDICATIONS”). DensiMAX® tablets should be used cautiously in patients with hyper-phosphatemia and/or hypo-phosphatemia. These patients should have increased monitoring of their serum phosphate levels (see “CONTRA-INDICATIONS”). DensiMAX® tablets should be used with care in patients with achlorhydria as these patients have lower calcium absorption in a fasting state compared to patients with normal gastric acid secretion. When calcium is taken with a meal, reduced gastric acidity does not significantly impair absorption. Patients with achlorhydria should therefore take calcium with a meal (see “CONTRA-INDICATIONS”). DensiMAX® tablets should be used with care in patients that smoke. Cigarette smoking decreases intestinal calcium absorption (see “CONTRA-INDICATIONS”). DensiMAX® tablets should be used with care in patients undergoing surgery. Patients should discontinue use at least 2 weeks before elective surgical procedures (see “CONTRA-INDICATIONS”). When starting, or stopping treatment with magnesium containing products, including DensiMAX® tablets, patients taking warfarin (or other coumarin anti-coagulants) should have increased monitoring of their INR (International Normalised Ratio) levels (see “INTERACTIONS”). The use of DensiMAX® tablets in children and adolescents under 18 years of age is not recommended due to lack of adequate data (see “DOSAGE AND DIRECTIONS FOR USE”). No studies on the effect of DensiMAX® tablets on the ability to drive or operate machines have been performed. It is unlikely that DensiMAX® tablets will affect the ability to drive or operate machines. Calcipotriene (Vitamin D analogue): may cause increased calcium absorption. Diltiazem: calcium can decrease effectiveness. Lithium: long-term lithium use may cause hypercalcemia. Potassium sparing diuretics: may increase levels of magnesium. Skeletal muscle relaxants: magnesium may increase levels. There is some evidence that taking calcium and vitamin D with the anti-retroviral (ARV) drug, raltegravir, possibly reduces its levels. Until more is known, use with caution when taking raltegravir along with repeated doses of calcium. The use of thiazide diuretics with calcium, as in DensiMAX® tablets could increase the risk of hypercalcemia, metabolic alkalosis and renal failure. Patients taking thiazide diuretics should consult their healthcare practitioner about appropriate calcium doses and to have their serum calcium levels and/or parathyroid function monitored regularly. These diuretics include chlorothiazide, hydrochlorothiazide, indapamide, metolazone and chlorthalidone. The use of antacids with magnesium, as in DensiMAX® tablets, may reduce the levels of magnesium. Patients taking antacids should consult their healthcare practitioner and may need to adjust their dose of magnesium. Magnesium, as in DensiMAX® tablets, may enhance the blood glucose lowering effects of anti-diabetic medicines. Patients on anti-diabetic medicines should monitor their glucose levels closely when taking DensiMAX® tablets. Magnesium, as in DensiMAX® tablets, may increase the effect of oral anti-coagulants and anti-platelet drugs (e.g. warfarin, aspirin, clopidogrel, dalteparin, enoxaparin, heparin) when taken concomitantly. Patients taking anti-coagulants or anti-platelet medicines should have their INR levels monitored more frequently when taking DensiMAX® tablets (see “WARNINGS AND SPECIAL PRECAUTIONS”). Calcium and magnesium, as in DensiMAX® tablets, may decrease absorption of bisphosphonates, taken to prevent loss of bone mass, when taken concomitantly. Advise patients to take bisphosphonates 30 minutes before DensiMAX® tablets, but preferably at a different time of day. Some of these medications include alendronate, etidronate, ibandronate, risedronate and tiludronate (see “DOSAGE AND DIRECTIONS FOR USE”). Calcium carbonate, as in DensiMAX® tablets, may reduce the effectiveness of levothyroxine in patients with hypothyroid. Advise patients to take levothyroxine and calcium supplement at least 4 hours apart (see “DOSAGE AND DIRECTIONS FOR USE”). Advise patients to separate doses of the below medicines by at least 2 hours before, or 4-6 hours after DensiMAX® tablets (see “DOSAGE AND DIRECTIONS FOR USE”). There is evidence that taking calcium, as in DensiMAX® tablets, with integrase inhibitors, used to treat HIV, may reduce levels of the medication. These medications include dolutegravir and elvitegravir. Calcium and magnesium, as in DensiMAX® tablets, may decrease the absorption of tetracycline and quinolone antibiotics. Tetracyclines include demeclocycline, doxyclycline and minocycline. Quinolones include, ciprofloxacin, levofloxacin, ofloxacin, moxifloxacin, gatifloxacin, Gemifloxacin and others. Calcium, as in DensiMAX® tablets, may decrease the absorption of sotalol. Magnesium, as in DensiMAX® tablets, may decrease levels of gabapentin. Use DensiMAX® tablets under supervision of a healthcare practitioner. Take 1 tablet twice daily with meals or as prescribed. Not recommended for use (see “WARNINGS AND SPECIAL PRECAUTIONS”). Bisphosphonates must be taken 30 min prior or at a different time of the day. Levothyroxin must be taken at least 4 hours apart from DensiMAX® tablets. Integrase inhibitors, tetracycline and quinoline antibiotics, sotalol and gabapectin must be taken at least 2 hours before, or 4-6 hours after DensiMAX® tablets (see “INTERACTIONS”). The following side-effects may occur with the use of DensiMAX® tablets. Frequency unknown: Hypercalcemia, Milk-alkali syndrome, hyper-magnesemia. Frequency unknown: Myocardial infarct, atherosclerosis. Frequency unknown: Gastro-intestinal irritation, nausea, vomiting, diarrhoea, belching, flatulence and acid reflux. Frequency unknown: Nephro-calcinosis and renal insufficiency. Thirst, hypotension, drowsiness, confusion, loss of tendon reflexes, muscle weakness, respiratory depression, cardiac arrhythmias, coma and cardiac arrest. Contact a poison control centre in area. 60 Tablets packed in a 125ml amber glass bottle with a seal and mustard gold screw cap in a product box and package insert. Store at or below 25 ºC in a dry place. Explore our Herb Library for additional information on traditional uses of herbs. Read more about bone health in our blog ‘Bone health and the calcium connection’. 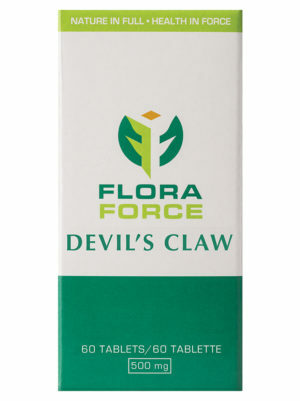 FLORA FORCE® DensiMAX® tablets is a multi-mineral supplement with calcium from the Lithothamnium calcareum alga, and Vitamin D. Calcium supports healthy bones and teeth and plays a role in maintaining good health. Calcium intake, when combined with sufficient Vitamin D, a healthy diet and regular exercise, may reduce the risk of developing osteoporosis.